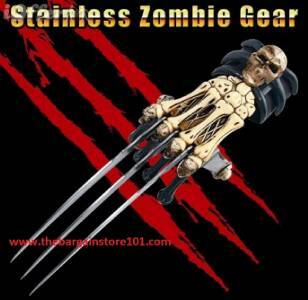 This is the Zombie Gear Demon Bones Tri-Bladed Hand Claw. -The Blades of the claw has been constructed from 440 C Stainless Steel. -The blades feature a unique design. The claw comes sharp. -The handle is metal with polyresin accents in the from of skulls. -The claw secures to the hand with a velcro wristband. Zombie Survival Gear Demon Bones Tri-Bladed Knife Fantasy Stainless Steel Hand Claw 17"
Free Economy Shipping only to the lower 48 US states! We will NOT ship this item to P.O. Boxes & APO. Please add $5.00 for shipping to P.R. Please e-mail for shipping prices to HI. Please see prices for other services and international shipping prices. Check out our Awesome Store for more Great Items on our website!!!! Please contact us if any other payments option is need. Please note all CC payment must go through Pay Pal. Go to Pay Pal & choose I do not have a Pay Pal account option then you will be prompted to input you billing & ship to address & CC information & then your payment will be processed & a receipt will be e-mail to you with the e-mail address you supplied when checking out. It shall be the purchaser's responsibility to determine any local restrictions concerning the purchase of any of our products to comply with all applicable laws. No items will be shipped to any state or other jurisdiction where prohibited by law. For more items that may not be listed on our Amazon Store please see our website where we do offer pre-sales on item that has not been released to the market. You must check out the pre-sale to reserve your order before they sell out. Please note the release dates on knifes are only an estimate. ETA does change and may get pushed back. Please note that we get our knives directly from the factory in most cases we get the first shipment when they are released. In some cases the factory will only release a small amount of knifes or swords that are very popular when they are released, so the orders that were placed first will be filled so other orders placed at a later time may be delayed. All sales are final unless item is out of stock and unavailable due to selling these items on multiple web-sites. The 14 Day return is only for items that the customer pays to have sent back to us and has never been opened. The item must still be in factory package complete and not been open or used. Damages must be filed with the shipper. We would be glad to assist you in this process. Since we do offer free shipping returns that we do accept will have a 20% restocking fee plus actual shipping fee that it cost us to send the item to you. Any signs showing that the box has been open the buyer will not be refunded for the item. An e-mail will be sent out and the customer will have 10 days to have a prepaid label sent to us to have the same item reshipped back to them. If a prepaid label is not received within 10 days from the date of the e-mail sent for the open package or used item the item will be disposed of. Some items sold include shipping. If your item is one of those items that includes shipping we will refund you minus the actual cost of shipping fees to ship the item to you. Please note each package shipped to a customer has a different price; we apologize in advance if this occurs, but is due to supply and demand of items being offered on multiple websites including this site. Returns are only accepted for miss shipped or defective items. Items outside of the US have to pay for shipping back. Please contact us within 48 hours of receiving item to get an authorization of return. Some defective and damaged items may need to be sent back to the factory. Buyer may be liable to pay for the shipping fees to the factory. A new item will be sent for replacement after the old item is received and inspected. Any item with physical damage by use from the persons who brought the item will not be accepted back for a refund. If it is found damaged at the time of inspection will not be replaced and buyers will pay to have this item shipping back. Buyers must pay within 5 days for shipping on these items or the items will be disposed of. Any item being returned will required a return authorization # (RMA#). An item which is returned without an RMA# or the RMA# is not written in big bold black print on at least 2 sides of the package will be disposed of without any contact of the person who sent the package. Also any packaged return with an RMA# needs to have a copy of the buyer's invoice included in the package. We will ship worldwide please contact us with your full shipping address for estimate. All shipments outside of Canada and the US is not listed and the buyer must pay the extra fee. Domestic rates apply to the lower 48 states within the United States ONLY. Please note it is the customers responsibility to pay any custom, duties, taxes or brokerage fees that your country and shipping service may have added to the item when it is being delivered! Please note that is done by your country and we do not have any control over these prices. ADDITIONAL CHARGES APPLY TO ANY AREA OUTSIDE OF THE LOWER 48 STATES NO EXCEPTIONS! Winning bidders must contact the shipping company to be compensated for any damages to product incurred during shipping. If the shipper's website states that the package has been delivered, but the buyer did not get the package, buyer must request reimbursement from the shipper. Please keep all of the shipping materials and packaging and contact the shipping company to file a claim. Shipping companies are liable for any shipping damages or lost items. Buyers are responsible for paying any applicable shipping taxes and fees charged for receiving merchandise from the United States. If the buyer refuses a shipment buyer is still liable for payment on product and shipping cost. We have to pay for the item to be delivered back to us. If buyer wants have the product re-shipped back to them they will be responsible to pay the shipping fees again. The second time shipping is not free. Please note item shipped Via USPS the buyer must take the package to their local post office and claim the damaged claim report. We have no control over this claim. It will be processed by the USPS in most cases this takes 6 days to process the claim. Please note that we have no control of the USPS and unable to do anything with damages. All claims must be done by the receiver. This includes any packages that are shipped worldwide. Also when shipping via USPS we must also include the price of shipping plus the price of the item so customer fee may be higher for the item. We may not ship to P.O. Box or APO after you have purchased and / or won an item, you must have a confirm Pay Pal PHYSICAL ADDRESS or your item will not be shipped. Most items are shipped by UPS or Fed-Ex. UPS or Fed-Ex does not deliver to P.O. Boxes or APO. All packages like DVD's, Mouse's, Small Pocket knifes, Daggers, very small swords and some keyboards may be shipped through USPS. Worldwide shipping we do ship via USPS.